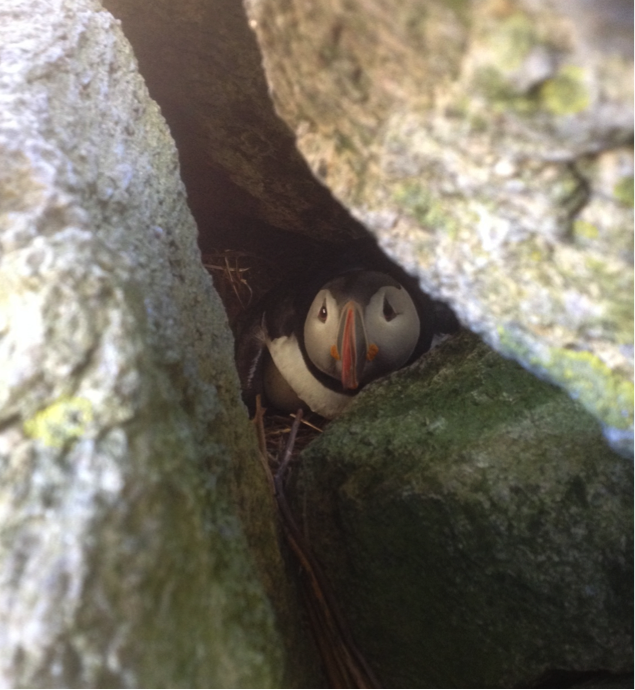 Earlier this summer, aquarists Austin Brayton and Jackie Anderson camped on a remote island in Maine to assist with Project Puffin, an Audubon Society project designed to restore populations of these clownish little seabirds. In this post, Austin provides some background and illustrates her first day on Seal Island. This summer aquarist Jackie Anderson and I had the amazing opportunity to participate in Project Puffin. Project Puffin was started by the Audubon Society in 1973 to restore puffins to islands in the Gulf of Maine where they had nested until the late 1800s when they were largely exterminated due to hunting for their meat, feathers and eggs. In an attempt to restore the colonies, young puffins were brought to the islands from Newfoundland, which has a healthy population of the birds. Eventually some of these puffins returned to nest on the Gulf of Maine islands and their population has been slowly increasing. Tern colonies have also been restored to the islands through the efforts of the project. Today staff members, interns and volunteers spend the breeding season on these islands to implement management activities that help the colonies, like removal of invasive vegetation, and to monitor the health of the seabird populations through gathering data for several long term studies. The primary focus of my work at the Aquarium is our shorebird exhibit which features local shorebirds (several species of plover and sandpiper) as well as two common terns, so I was very excited to participate in some hands-on field work and to be able to observe terns in the colony while also helping with their conservation. Jackie and I went as volunteers to two different islands, Matinicus Rock and Seal Island, where we stayed for two weeks. Matinicus Rock features a light house. 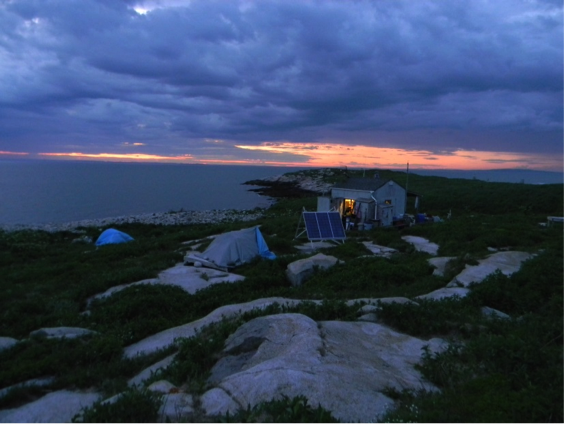 Seal Island has a tiny cabin with a propane stove for cooking. The participants sleep in their own individual tents. Neither of the islands has running water, but getting to spend so much time out in nature certainly made this minor hardship worthwhile. Banding birds is tricky business! During my first day on Seal Island I got to observe Arctic Terns being trapped, measured, banded and released. The data is used for a long term demographic study of Arctic Terns in the Gulf of Maine. Arctic Terns, as well as several other species of tern including Common Terns, have been declining in population in the US and information gathered through the efforts of Project Puffin can help us to understand why and can identify the best management practices. 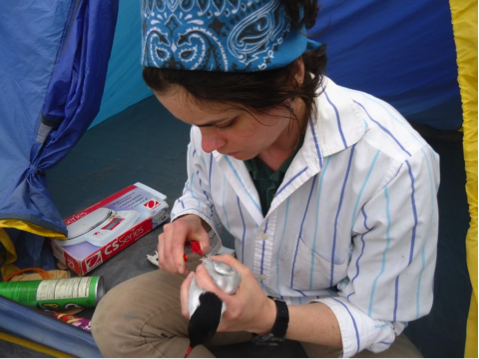 On my second day, I got to band adult terns myself which was a little nerve-racking as you have to apply considerable pressure with one hand in order to close the metal ID band with special pliers while holding the bird gently in your other hand.